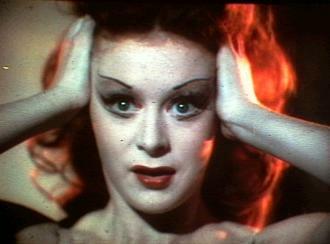 Moira Shearer in THE RED SHOES, the 1948 film classic exquisitely restored and featured at the first annual Montclair (NJ) Film Festival on May 6. Marty Scorsese has called this film one of the five greatest films ever made and a film that, after he saw it for the first time at age 5, changed his DNA forever. I took a chance and attended a few screenings at the first annual Montclair (NJ) Film Festival last week (May 1-6)and was glad I did. Having weathered 15 American Film Festivals and 11 Christopher Awards galas, as a staffer, program manager and event producer during my career, I was impressed with this inaugural effort to shine a light on some new hot-button documentaries and offbeat indie dramas, as well as two restored vintage films and talented local and not-so-local talent (including Oscar winners: director Michael Moore, actress Olympia Dukakis and editor Thelma Schoonmaker; and Tony nominee Kathleen Turner, among others). I was also especially encouraged by the cordiality of the Festival’s dedicated on-site support staff (more than 250 volunteers of all ages!) manning various far-flung venues. Montclair is an artsy town, within easy commute of New York City, so it’s an appealing residence for notable show folk in front of and behind the camera. Several years ago, I visited the great actor/singer/dancer Eddie Bracken at his lovely Montclair home, hoping to convince him to be a presenter at our upcoming Christopher Awards gala. He performed regularly at the Paper Mill Playhouse in Millburn (NJ) at that time, but he was in failing health and sadly never made it to the gala. He was, however, a gracious host to me that day, and I relished his anecdotes and the incredible memorabilia, film posters and photographs that filled every room and heralded each decade of his stage, TV and film career (The Miracle at Morgan’s Creek and Hail the Conquering Hero to name just a few). Today, Montclair “names” run the gamut from Stephen Colbert and actor Patrick Wilson to legendary “linguist” Yogi Berra. Montclair is a mecca for foodies, music and film fans who feast at a wide array of international restaurants, flock to a multiplex (Clearview’s Clairidge Cinema) that showcases independent and foreign films, and converge on The Wellmont, a onetime vaudeville/movie palace that is now giving NYC’s Beacon Theatre a run for its money by featuring music acts of all persuasions, from Tony Bennett to Death Cab for Cutie. This entry was posted in Film and tagged American Film Festival, Christopher Awards, Eddie Bracken, Kathleen Turner, Michael Moore, Montclair Art Museum, Montclair Film Festival, Montclair State University, Olympia Dukakis, Patrick Wilson, Stephen Colbert, The Perfect Family, The Red Shoes, Thelma Schoonmaker, Yogi Berra. Bookmark the permalink.